The new Nokian Hakkapeliitta C3 studded tire makes life easier for heavy duty professionals. These durable studded tires can master harsh winter conditions; in addition to the balanced winter grip that is synonymous with the Hakkapeliitta brand, it offers stable handling for professional drivers. The new square steel stud ensures excellent winter grip on both the slippery city delivery routes and main roads. The experience and new innovations of the winter tire inventor can also be felt in the Nokian Hakkapeliitta C3. The steel belt package and rubber compound, optimized for heavy use, provide structural durability and high-end performance for the rough Northern roads, and the tire's characteristics are also preserved as it wears down. Low rolling resistance effectively reduces fuel consumption. The Nokian Hakkapeliitta C3 utilizes a comprehensive selection of modern tire technology, and its wide selection of sizes is excellently suited for all modern delivery vehicles and vans. We offer a selection of 20 products, from 14 inches up to 17 inches; this is the most extensive product range on the market. The size selection of the new product family uses one tread pattern for lighter and heavier vehicles alike. Consumer sales for the Nokian Hakkapeliitta C3 will begin in the autumn of 2014. The new Nokian Hakkapeliitta C3 represents tested safety. Its first-class winter properties were fine-tuned at Nokian Tyres’ Ivalo Testing Center which is located north of the Arctic Circle. As is typical of the Hakkapeliitta family, the tread pattern is symmetrical and directional and has excellent self-cleaning properties in snow and slush. The heavy siping of the aggressive tread pattern provides the necessary grip for the most slippery winter days. The massive and long tread blocks, which extend to the side from the center area, improve handling on bare roads. Balanced grip is essential for heavy and versatile vans. Maximizing lateral grip is especially important in order to maintain control of the powerful vehicle even in sudden turns. The strong Hakkapeliitta C3 has a modified, advanced square steel stud that boosts grip on ice and improves stud durability, enabling excellent grip even as the miles pass by. In addition to the hard metal stud pin and bottom flange, the stud body is also square-shaped. The wide stud support improves grip on ice and anchors the stud even more firmly into the tread compound. The studs have several edges for maximizing the area of contact, in turn improving the grip of the studs on slippery surfaces. The optimized stud placement makes the noise level pleasantly low, which improves driving comfort, especially on longer trips. In addition to the grip that is convincing even under extreme conditions, the driving feel of the new product is precise and logical, almost similar to a passenger car. 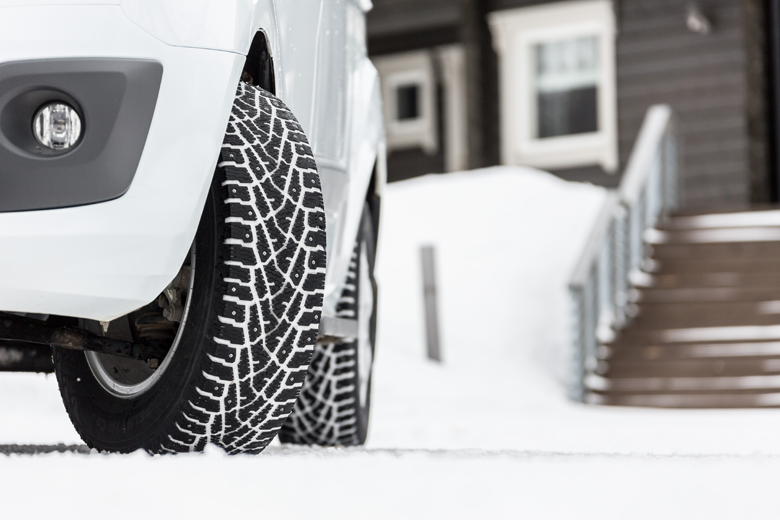 The tire handles calmly and with precision on snow, ice, and slush alike. The body structure of the supremely durable Nokian Hakkapeliitta C3 has been optimized to carry high wheel loads and to adapt to the requirements of high axle weights. The steel belt package that is tailored for a double body structure has been developed in many ways. The steel belt package is durable, and the pocket strips integrated into the edges of both steel belts are a unique design feature. This solution ensures that the steel belts are durable in heavy use and that they can be securely attached to the structure. The new, more flexible steel cord that has been adjusted to suit the steel belts both improves structural durability and allows the tire to retain its state-of-the-art characteristics for longer than before. At the same time, this solution reduces rolling resistance, in turn enhancing fuel economy. The tire's firm winter grip and stable handling are ensured by the cap & base structure and the new tread compound that has been adjusted for the demanding Northern conditions. This rubber compound, refined for hard use, works excellently along a wide temperature range, tolerates hard tire wear, and makes the new product roll lightly. On account of the high percentage of natural rubber, the new Nokian Hakkapeliitta C3 can maintain its safety characteristics even in very cold weather. Canola oil improves the tear strength of the tire as well as its grip on snow and ice. The specially tough and strong bottom rubber layer of the dual-layered cap & base structure locks the stud to the tread block and improves bare road handling. The bead area of the tire also has a specially developed, strong Clinch rubber compound. The compound presses flexibly against the foot of the rim, making the bead area more durable when handling massive loads. This innovation also successfully minimizes the cabin noise of the vehicle, since it reduces the vibrations from the tire body, preventing them from passing over onto the rim and further to the inside of the vehicle. The symbols patented by Nokian Tyres make winter driving easier and increase safety. The tire has a Driving Safety Indicator (DSI) that indicates the depth of the main grooves clearly in millimeters. The snowflake symbol of the Winter Safety Indicator (WSI) also indicates the winter safety of the tire. It remains visible to a tread depth of four millimeters. Once the snowflake has worn out, new winter tires should be purchased. Safe winter driving requires a minimum groove depth of 4 mm. Correct tire pressure is especially important in commercial driving and under heavy loads. Correct tire pressure improves the driving feel of the vehicle, ensures the structural durability of the tire, and reduces fuel consumption. Pressure management is made simpler by an info field that allows for noting down the correct tire pressure and the place of the tire under the car. Safety is improved further by a new area that can be used to record the tightening torque of bolts for alloy rims. Durable square steel studs ensure a balanced winter grip. Comes standard with more durability and low rolling resistance and provides excellent handling throughout the tire's service life. Precise and stable handling, even with heavy loads. Modern square steel stud. More safety. Durable square steel studs ensure excellent grip even as the miles pass by. The studs have several edges for maximizing the area of contact, in turn improving the grip of the studs on slippery surfaces. The optimized stud placement makes the noise level pleasantly low, which improves driving comfort especially on longer trips. Tailored steel belt package. Commendable durability. The steel belt package tailored for the double body structure is durable. The pocket strips integrated into the edges of both steel belts are a unique design feature. This solution ensures that the steel belts are durable in heavy use and that they can be securely attached to the structure. The new, more flexible steel cord both improves the structural durability and allows the tire to retain its state-of-the-art characteristics for longer than before. At the same time, this solution reduces rolling resistance, in turn enhancing fuel economy. New tread compound. Excellent winter grip and fuel efficiency. This rubber compound, refined for hard use, works along a wide temperature range, tolerates hard tire wear, and reduces rolling resistance. The high percentage of natural rubber allows the tire to maintain its safety properties even in very cold weather. Rapeseed oil brings tear strength to the tire and improves grip on snow and ice. Clinch rubber compound. Optimized durability. The compound presses flexibly against the foot of the rim, making the bead area more durable when handling massive loads. This innovation also successfully minimizes the cabin noise of the vehicle, since it reduces the vibrations from the tire body, preventing them from passing over onto the rim and further to the inside of the vehicle.